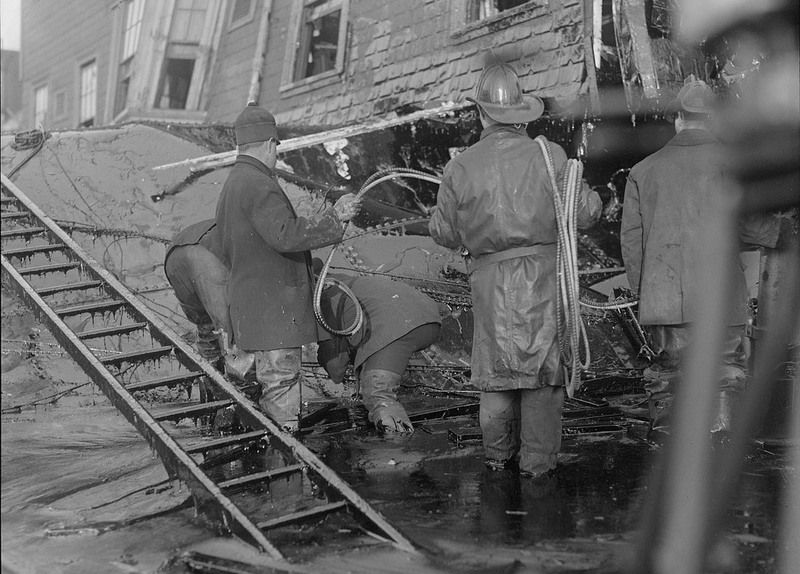 Bostonians this morning lined the perimeter of the Purity Distilling Co.'s leaky, 50-foot-tall molasses tank, which burst around 12:40 p.m. on Jan. 15, 1919, creating a gooey flood that killed 21 Bostonians and a number of horses and destroyed buildings in its path. Read more. No, not the sweet smell that would rise every summer from the North End. Pacific Standard explains how the disaster on Jan. 15, 1919 led to dramatic changes in the way cities and states regulate construction projects to reduce the odds of shoddy work leading to catastrophe (we saw a similar thing after the Cocoanut Grove with fire-safety regulations). Events marking the 100th anniversary of the Flood. Flood aftermath. See it larger. From the Library of Congress collection. 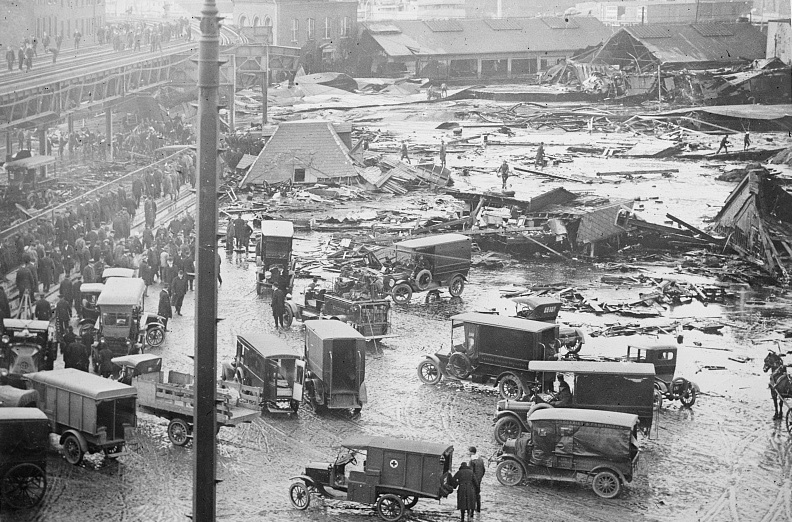 Stephen Puleo, who literally wrote the book about the 1919 Great Molasses Flood (Dark Tide), will give a talk on the deadly, brown, gooey tsunami at the BPL on Jan. 15 - 100 years to the day after a shoddy, 50-foot-tall molasses tank on Commercial Street in the North End exploded, sending a deep river of warm molasses along the waterfront at 35 m.p.h., killing 21 people and several horses, demolishing a fire house and warping the elevated tracks that then ran above the street. Read more. BroadwayWorld.com reports on the planned May opening of an off-Broadway production of "Molasses in January:"
An original new musical about a struggling family of Italian immigrants who are literally swept up in the Boston Molasses disaster of 1919. A couple of kids recapture the horror of a molasses tsunami in the North End 98 years ago today. Associated Press reports Harvard scientists who study fluid dynamics turned their eye to the Great Molasses Flood and, after studying how molasses flows at different temperatures, concluded that the relatively warm molasses that flowed out of that North End tank quickly cooled in the relatively chill Boston air (the disaster happened during one of our January thaws), going from liquidy to gooey and trapping people and horses. Also: Molasses is a non-Newtonian fluid. Up to their knees in molasses, looking for victims. 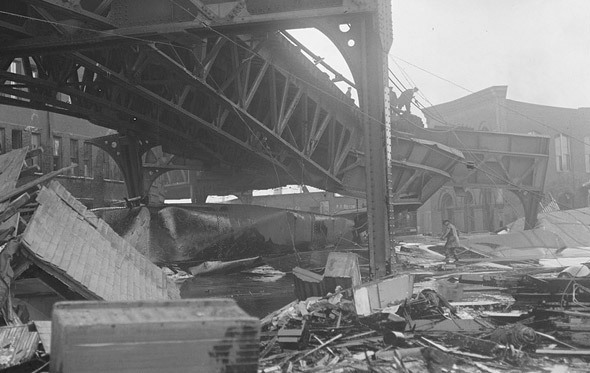 Among other things, the Great Molasses Flood took out the elevated subway tracks that ran over Commercial Street, as shown in this photo by news photographer Leslie Jones. 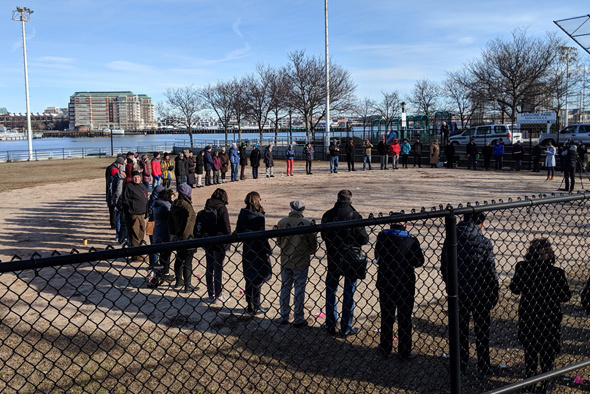 At 12:30 p.m., take a moment to remember the 21 people killed by a gooey, bittersweet flood of more than 2 million gallons of molasses, just moments after the machine-gun-like sound of rivets giving way echoed across the North End and the tank burst on an unseasonably warm January day in 1919, thanks to shoddy construction by the tank's owner. Read more. And what better place for it than the Greenway? Not because the 1919 sticky death flood happened there, but because the Greenway is where all memorials are supposed to go these days (and the state is seeking proposals for what to put atop Big Dig ramps). Sweet holy Jesus, there's a wall of molasses coming for me and my fam-i-lee. Listen to the lyrics at the beginning, and you'll notice that whoever wrote them obviously read their Puleo. From the BPL molasses collection. On this day in 1919, 21 people died when a poorly maintained molasses tank off Commercial Street exploded, sending more than 2 million gallons of the syrup roaring down the street at 35 m.p.h. The above photo is from the Boston Public Library's collection of molasses images and shows what the stuff did to the elevated that ran down the street at the time. Dark Tide - The definitive book on the disaster. At first, the woman in front of me jumped a bit when I popped my head over the seatback and said, "Would you like me to autograph that?"